Nixon Motor Sports: Need More Racing This Weekend? 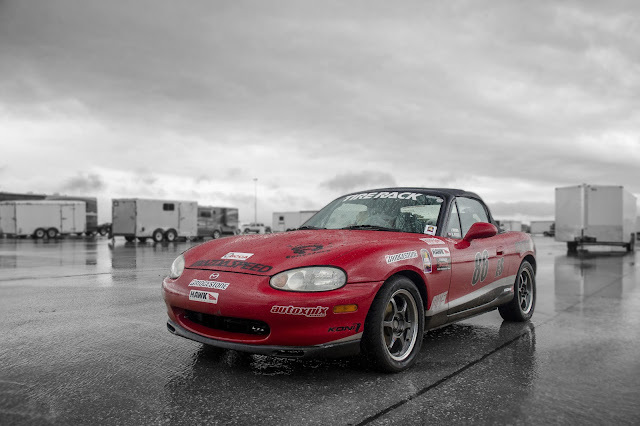 Besides the usual races that everyone else watches (NASCAR, Formula 1, etc), all the cool kids will be checking out some Miata racing this weekend, since there are TWO race series going on today. Sure, a pack of Miatas racing wheel to wheel on a track aren't going to be as fast as those other guys, but holy smokes, we'll guarantee you that they are very evenly matched and that the racing is a ton of fun to watch! Race 1 on Saturday, March 24 should be at 1:05 pm CDT (2:05 pm Eastern, 12:05 pm Mountain, 11:05 am Pacific). Note: rain is expected on Saturday, so the start may be delayed. Race 2 on Sunday, March 25 should be at 10:20 am CDT (11:20 am Eastern, 9:20 am Mountain, 8:20 am Pacific). Again, times are approximate. "Fans who tune in to the livestream will be treated to some of the closest sports car racing in North America. The Global MX-5 Cup cars are built identically and place a premium on driving ability, which was borne out by the 12-race 2017 season having a total margin of victory of just under four seconds. This weekend, thirty-two of those Global MX-5 Cup cars will take on COTA and battle for championship prizes that include the $200,000 Mazda Road to 24 scholarship awarded to the season champion and $75,000 awarded to the Global MX-5 Cup Rookie of the Year."